You can link Facebook Pages to Grata so that when users send your Page or your Messenger account a message, it will trigger a chat in Grata. As Facebook is blocked in Mainland China, this feature is currently only available for clients who are using an international Grata account (contact us if you would like to move your account). Log-in to your Grata account and open the Admin Panel from the welcome banner or by clicking on your username in the top right corner and selecting “Admin Panel” from the drop-down. Select “Facebook Accounts” from the side menu options. If you’re in China, you will need to use a VPN to connect to Facebook. Login to your personal Facebook account to access any pages of which you are an administrator. 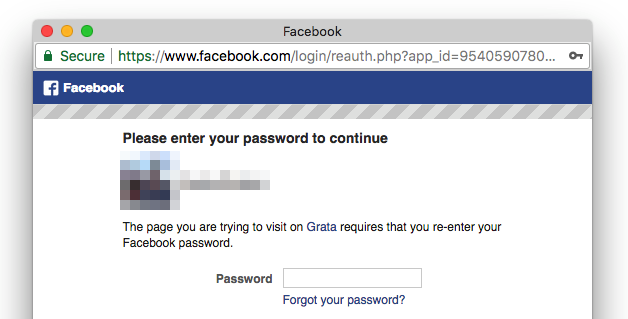 If you are the admin of multiple Facebook Pages you can select which Pages you would like to connect to Grata from the Facebook login dialog.